The field of industrial hygiene (IH) is devoted to the anticipation, recognition, evaluation, prevention, and control of environmental factors or stresses arising in the workplace. IH specifically addresses factors which may cause sickness, impair health, well-being, or significant discomfort among workers, bystanders or the community. At Total Environmental Concepts, our industrial hygienists focus on chemical, physical and biological stressors with emphasis on indoor air quality. This includes negative impacts on air quality caused by building materials, water damage, radon, vapor intrusion, construction and renovations. Air sampling is one of the most reliable methods for determining if there is an issue with air quality as a result of some hidden or unknown contaminant source. This sampling method allows a short “grab” or sample of air to be analyzed for specific contaminants. This type of air sampling helps evaluate indoor air quality to meet the requirements of post-accident clearance testing, or to determine the presence or absence of a contaminant during a short process. This type of sampling takes a short duration volume of air, typically 15 to 30 minutes during a work shift, for evaluation. The results can be contrasted with regulatory exposure limits based on a short-term sample, and can be carried out consecutively to see where peak exposures occur during discrete tasks. This method evaluates the air quality over an even longer period, usually a full eight-hour shift (TWA – time weighted average). Full-term exposure sampling is utilized to determine the overall average concentration of a contaminant during a workers’ complete shift. The time period used in this sampling method means that it effectively determines an individual employee’s personal exposure to a contaminant. At TEC, we have extensive experience with all types of indoor air sampling methods and can help develop a plan designed to safeguard your facility’s industrial hygiene standards. Subsurface contamination can result in potentially harmful vapors infiltrating an enclosed building or structure. Vapor intrusion mitigation aims to reduce the transmission of such harmful vapors in order to protect the building’s occupants. There are several methods through which effective vapor intrusion mitigation can be accomplished. A physical and chemical-resistant barrier between the contaminated surface and the structure can work to mitigate vapor intrusion, with both multi-layered barriers and coatings available depending upon the application. Further measures can also be used to assist in vapor intrusion mitigation such as active venting systems. While vapor intrusion mitigation does help control toxic vapors from harming a building’s occupants, it does not remove the contamination source but simply blocks vapor transmission. For this reason, vapor intrusion mitigation is often employed in conjunction with remediation solutions that aim to remove the contaminants from the soil and/or groundwater. At TEC, we can suggest a solution that best protects your employees or tenants/occupants from environmental contaminants. Employers are tasked with the responsibility to provide their workers with a safe, healthy environment. Not following industrial hygiene standards, or failing to meet the requirements outlined by OSHA (Occupational Safety and Health Administration) or other agencies, can result in governmental fines, workers’ compensation premiums or other issues. At TEC, we can assist your company in understanding regulatory requirements and help you meet them while addressing any IH issues that arise. Accidents occurring during construction, or on a construction site, can have disastrous consequences for employees and your organization. 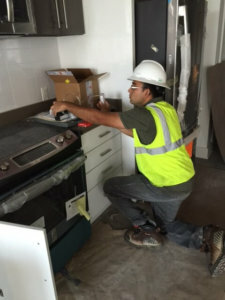 Taking steps to properly coordinate and monitor workers’ health and safety during the construction process is necessary to safeguard your business and avoid breaching the safety and health requirements dictated by agencies such as OSHA. At TEC, our construction health and safety monitoring services can ensure that you are maintaining a safe workspace at all stages of construction. We can suggest proactive measures to help avoid accidents by identifying risks and drafting safety plans to avoid injury while simultaneously improving onsite productivity. We can help your business foster a long-term culture of safety to protect your employees.